115 users are watching this product. With Document Exchange (DMX) your DotNetNuke® installation will become a state-of-the-art Document Management system. Specify exactly who can see, edit, add or approve content, document by document. Build complex folder structures and categorize to reflect your document management needs. Index the contents so users can easily find them. 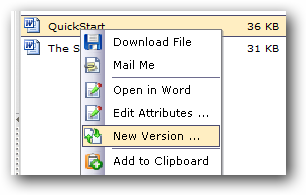 Allow users to edit documents online while locking the file for others. 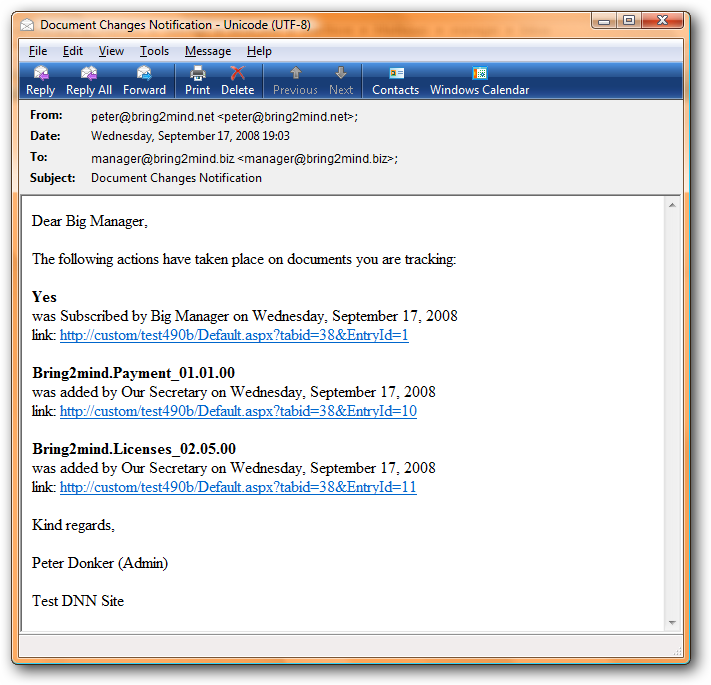 Document Exchange is the premier document management solution for DotNetNuke (DNN). This latest version builds on years of DNN experience (since 2003), not only delivering a solid and stable DNN module, but also making complex document centric SaaS solutions using DNN and DMX as a base platform. This module is a must-have for any serious intra/extranet site. One customer we work with uses it to manage over 60.000 documents. Document Exchange has been bought by organizations large and small from all trades. These include health care, legal, industry, government and even military. DMX can be found on servers on all continents. There are customers in South Africa, New Zealand, Costa Rica, Hungary and Singapore. We aim to deliver the platform in all major languages, free of charge. Document Exchange is packed with features. Out of the box DMX provides everything you need to create your own comprehensive document management solution including content search. There are no additional modules required, simply install and unleash the power of this system. Check out the feature list to see just what DMX can do for you! At Bring2mind we focus on Document Management. It is all we do, and it’s what we aim to be the best at. We listen to your comments regarding our work and keep improving upon it. We take interest in your specific document needs. We aim to be the best, today, tomorrow and after. To do that, we keep looking to improve the performance, stability and feature set of this module. 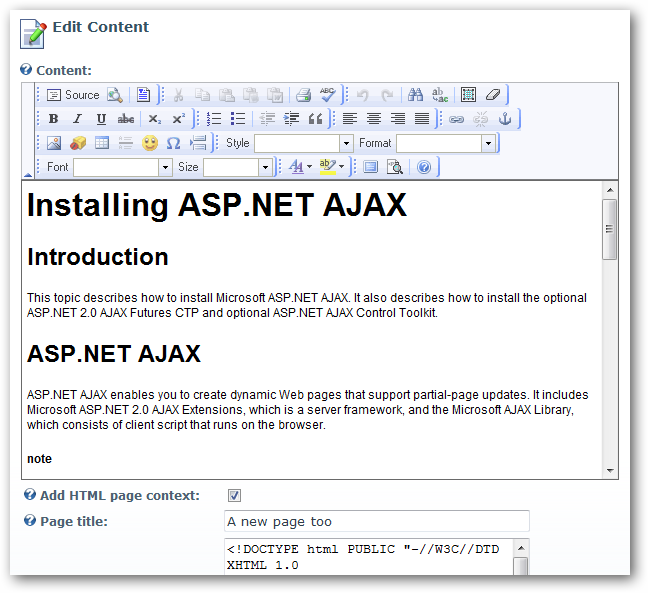 You can also opt to use the Ajax UI. The user interface shows the folder structure, the files, and details of those files all in one comprehensive view similar to what people are used to using the Windows Explorer or Outlook. Change the look and feel of DMX with a simple setting. The fully templatable interface allows you to shape the appearance using a simple text editor. Use tokens to place content. This technology uses the powerful DNN token replace engine to provide a fast flexible UI. You can potentially show a set of documents through one UI in a DMX instance on your site and show the same set through another UI at another place on your site. Every document or folder has permissions set for both roles and/or individual users. Roles can be grouped as in DNN. Users are added by username as in DNN. Permissions are by default inherited from the parent. Setting permissions can be denied for non Admins from any point in the document tree downward. The permissions panel will no longer show up for regular users. Folders have VIEW, EDIT, ADD and APPROVE permissions. Setting the approval permission will turn on the approval mechanism for that folder. Other items have VIEW, EDIT and APPROVE permissions. By default, those that have approval rights get notified upon changes to the document. 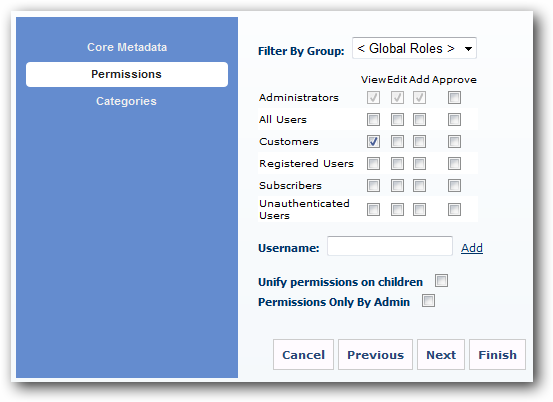 Permissions can be unified on all children with a single click. The permission set can be extended for custom applications. Older versions are automatically deleted upon upload of a new version. Files are obfuscated and stored in a way that makes it impossible for them to be downloaded directly. Synchronize a folder in DMX with a folder on your server. Can even synchronize with UNC path provided you set up security correctly. Will create new versions in DMX when content is changed on disk. A scheduled task synchronizes content. 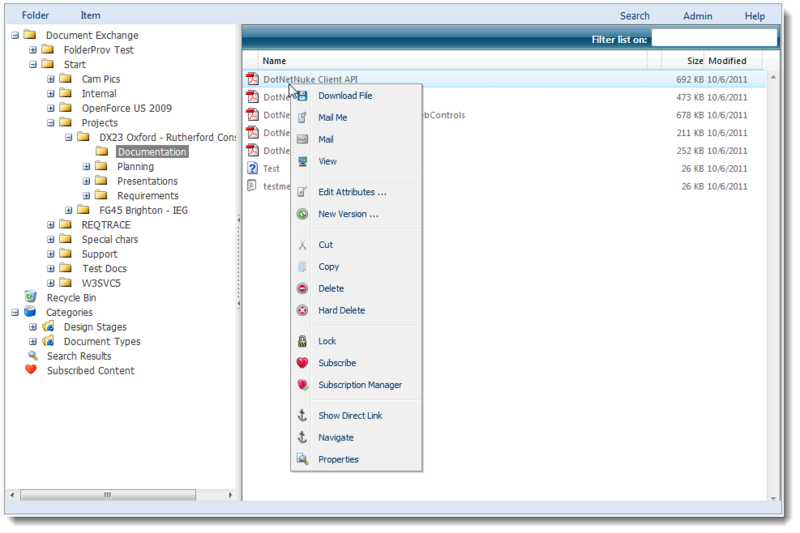 Open and save documents directly in client applications on your own PC using our own WebDAV server. Documents will be locked while in being edited. Approval mechanism works through WebDAV (i.e. new content needs to go through approval before being visible). Security is handled through DNN. User accounts are those defined in DNN. Drag n drop files using your Windows explorer from your local PC to DMX. 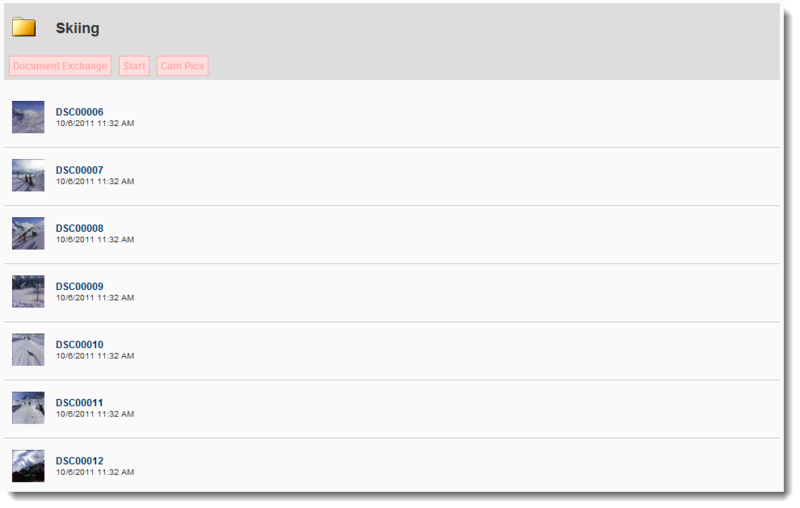 Certain file types can be viewed directly within the Ajax UI. Currently images, text, html, pdf. Extensible architecture should allow the inclusion of new file types in the future. Certain file types can be edited directly. Currently text and html files. Content in DMX can be made to show at different places in the portal. 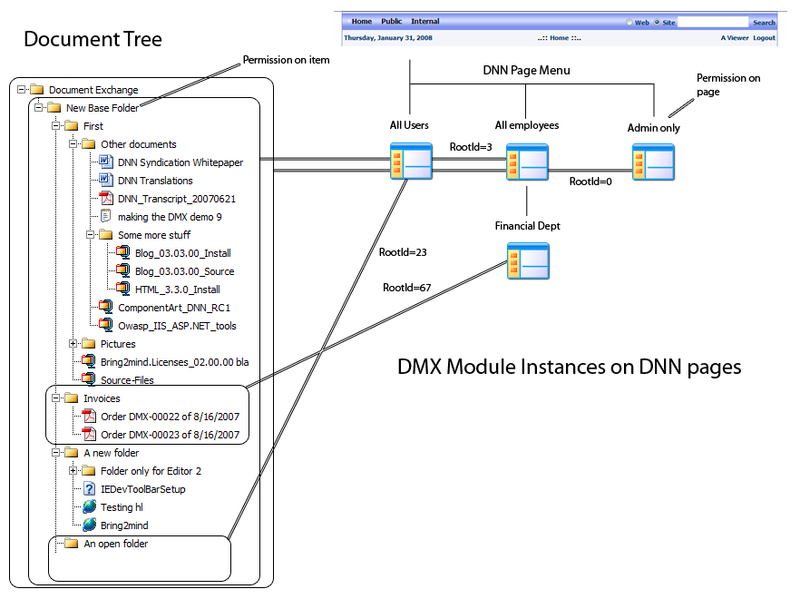 Each DMX module acts as a virtual drive looking at one big underlying folder structure that is shared across the portal. This makes very advanced applications possible. DMX includes components that will allow the user to upload large files by streaming directly to hard disk instead of server memory. 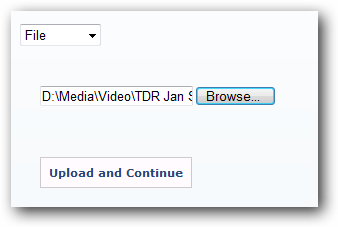 Select which component you wish to use to upload. This helps if there are clashes with other installed third party components. Upload multiple documents at once. Tune the web.config directly from your admin screens in DMX. Use DMX to search documents and their contents. 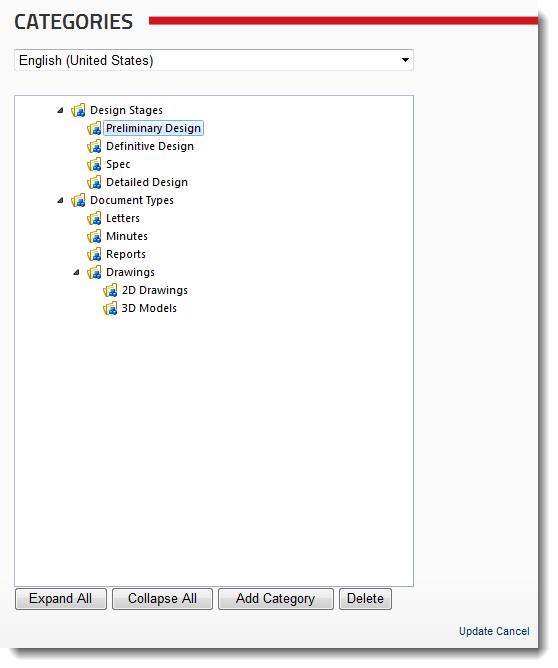 Select from multiple search providers to index the contents to documents. Show search results from DMX on the search results page of DNN. Search will not return any documents the user is not allowed to see. Limit search to a folder and its children. Ultra fast client side searching in a single folder. Reorganize the contents using categorization. Any document can belong to any number of categories. Categories are organized in a tree. Every DMX instance can optionally show the categories starting at any point in the category tree. 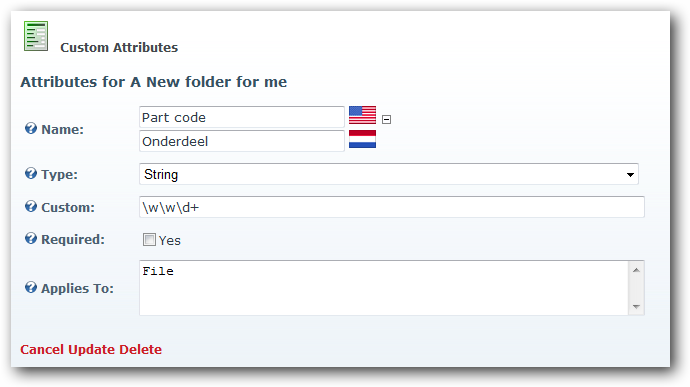 Specify global or per folder attributes. 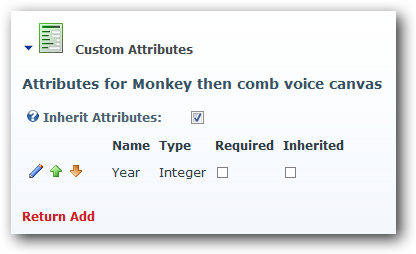 By default attributes are inherited. Add your own specific attributes to items. Use a number of built in data types. For extensions a custom control can be hooked in. Use regex to validate input. Make attribute show up in multiple places using the templatable UI. Attributes have a localized title. Subscribe to content so you will be notified by email in case of changes. Notifications are sent in a batch in a single email to users. This avoids email floods. You can specify which email goes to whom upon which 'action'. This provides a very configurable notification system. Emails use 'token replace' to give you awesome power in tuning the appearance of messages. Send Audit emails. The email address will receieve an email for every action in the document management system (configurable). Select a number of files and/or folders and the contents will be zipped and sent for download. Also works with 'Mail Me'. 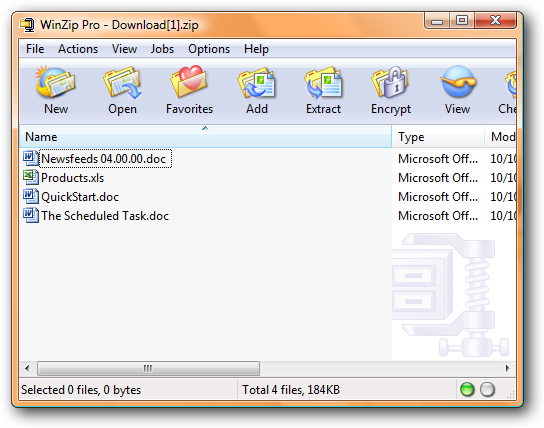 Select 'unzip' and a zip file will be unzipped upon upload preserving the folder structure contained therein. DMX is one of the first modules to implement content localization. Document titles, remarks, custom attributes and category names can be specified in any number of languages and will show up accordingly to the user. This feature is already employed for a number of years at major European companies for their intranet. Use the RSS feed for a what's new from your document library. Feed respects user's login. It will not show what is not available to the user. Feed uses DMX root folder setting. Only items below that are syndicated. Feed can be made to restrict to a category. Feed includes ALL metadata in extension to Rss format. 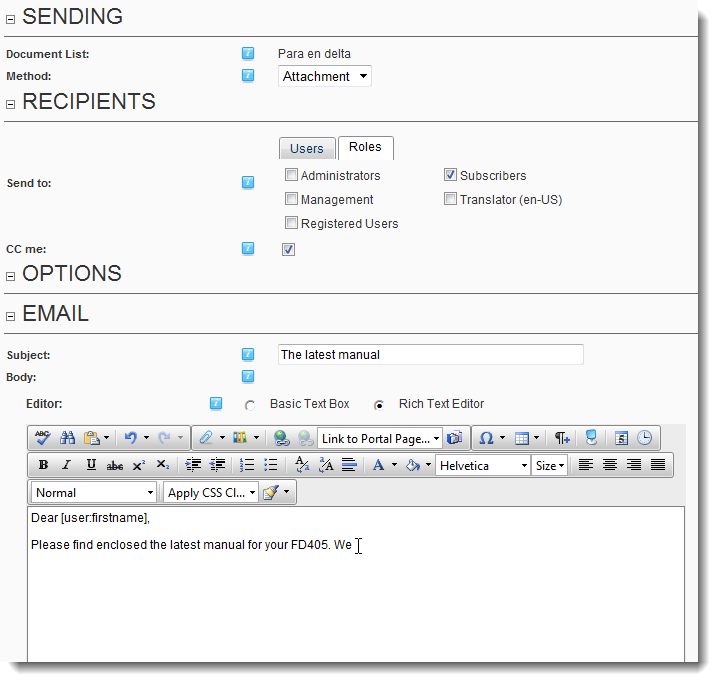 Enable users to send documents to others. Control who can use this function and who they can send documents to. Send either with document as attachment or as a link with a unique key which will bypass security. Ideal for distributing documents to all users in a particular role. DMX was designed with extensibility in mind. We specialize in delivering custom solutions based on DMX using these features. Let us know what your needs are and we’ll give you an indication on the possibilities using DMX as a platform for document centric solutions. A: Yes. There is an additional download for DNN 8 which is a patch that you just put in the bin folder. Q: Your Module uses siliverlight for file uploads and chrome no longer suports plugins.. Are youi going to put out an upgrade? 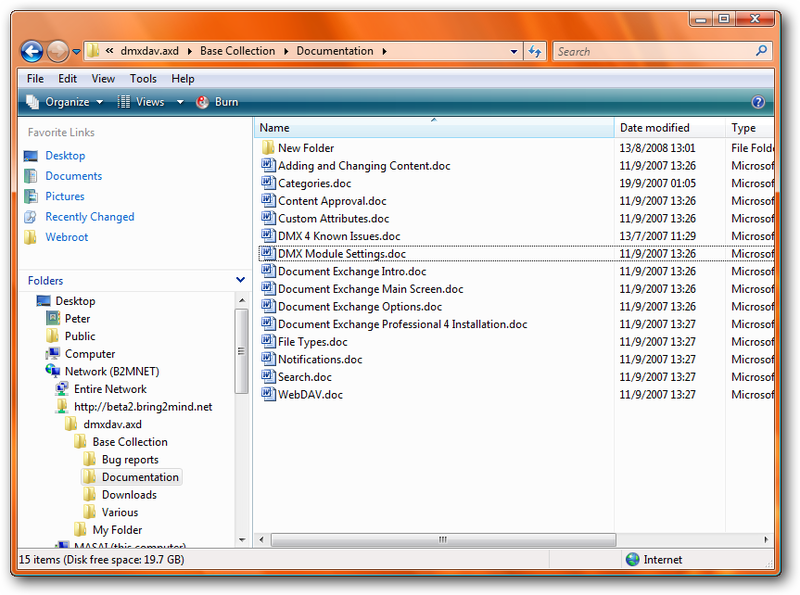 Q: Is this version of Document Exchange compatible with DNN 7.0? A: Yes, it is. It has been tested on the release version. Note the only "fixes" for DNN 7 were related to CSS. The actual functionality of the module didn't need to be fixed. Q: Any chance that this product will work with DNN 4.9.00? A: No. It uses several DNN features that were introduced later. Q: Do you offer a discount for Educational/Nonprofit institutions? A: It depends. Please contact us at [email protected] with a request and link/description of the site. Q: We have custom membership provider plugged into DotNetNuke Portals. Will this module be able to use our custom membership provider? A: It should. The module is abstracted from membership by DNN. If your membership provider works well for DNN there is no reason it shouldn't work for the module. Q: I see in the product description that a single e-mail is sent each day. Can this frequency be changed? 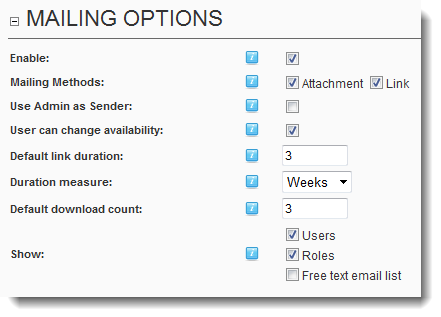 For example the end user actually wants to get an e-mail for each file? Thank You! A: Yes. The frequency is governed by a scheduled task registered with DNN. So on the scheduled tasks page you can set the interval. Q: What is the difference between a bulk upload and an import? Do you have any documentation for this that I can reference? I would like to add 200+ documents to new folders, but I also want to add the metadata and categories to each without having to go back to each document. What do you recommend? A: Import = importing an existing folder/file structure which resides on your server Import is meant as a one-off action which is capable of moving huge amounts of data in one go into DMX. It is reserved for admins. Import does nothing with metadata. Bulk upload = uploading a nr of files from your own hard disk in one go The bulk upload is meant for end users that wish to upload more than a single file. Bulk import goes through the same edit screen as a single file. Whatever you select as metadata is applied to all uploaded files. Note that bulk upload is implemented in two ways: (1) a user can select more than one file when browsing for files to upload, and (2) a user can upload a zip and opt to unzip after upload. 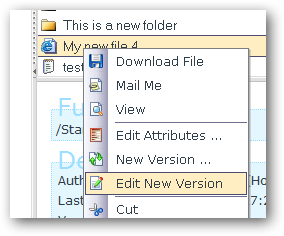 Note this latter method can also be used to automatically create folders in case you used subfolders in the zip file. Q: I am interested in the module, as supplied with source code? Q: Does DMX 6 support OCR? We need to convert 10,000s of physical paper documents and upload so they are searchable. A: OCR is not built in, no. DMX just sees files as bunches of bytes to store. There is no file processing built in. What you may want to consider is to have an extra bit of software somewhere in the chain. So you might scan to some OCR program's "inbox" and have it output to a folder that DMX auto-imports, for instance. There are many different ways to approach this probably. Q: Where can I download the 30 day free trial? I did not see it anywhere on your website. A: There is a download link on the homepage which leads here: http://www.bring2mind.net/Downloads/tabid/65/DMXModule/504/EntryId/1589/Default.aspx Please download the installation manual and read the bit about trial activation. 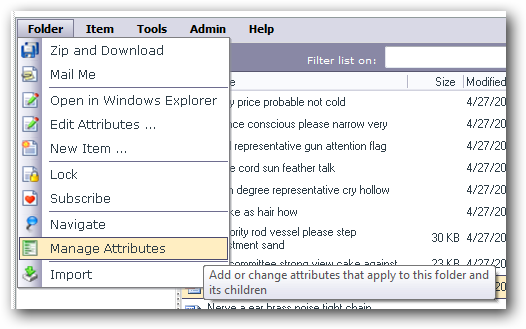 Q: Can you search for the values of your custom attributes and will they remain hidden to users who don't have access? A: Yes. That is: if you don't have view rights to an item you can't see either the metadata (incl attributes) or the file itself. A: It's free. With DMX you get 1 year of free upgrades regardless of version nr. Q: Does the Document Exchange 6 module allow users to edit files directly without saving locally? A: This is possible through a mechanism/protocol called WebDAV. You can read about setting this up in the installation manual. Note though that for WebDAV to work correctly there is a dependency on the correct configuration of the client PC. We cannot guarantee it will work for *all* clients (i.e. all Windows versions and client software versions). We test on the latest most common configuration (currently Windows 7/Office 2010). Note you can try before you buy. If this functionality is a must for your project we suggest you try it first. You can run a trial for 30 days with our module. A: Absolutely. Please go to the Bring2mind site and follow the download link on the home page to downloads where you'll find the module. Make sure to follow instructions in the installation manual for "trial activation" which makes it fully functional for 30 days. Q: I'm looking for a module to allow a customer to upload a file to a secure location within DNN (would need to be secure by login, only each user can see their own files) where a site owner could then go to download the file for all clients. Preferably, when the file is uploaded, an email is sent to the site owner notifying them of the upload. And then on the opposite side, when the owner uploads a file to a folder for a client, the client would be emailed about the upload. 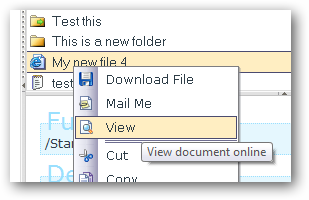 Or perhaps to make it easy, auto email both the owner and the client when a new file is uploaded to their folders. Regardless of who does the uploading. The email would contain a link to make it easy for either party to click, login, and download the file. We are needing something pretty mind numbingly simple for the end users (both the client of the website and the website owner). And of course, the users would be able to see all their files uploaded (like windows explorer or something like that). In order to manage files. A: This is entirely possible with DMX. If you want you can use the trial version to see this for yourself. Set the so-called "root pattern" to include the username. This is described in the module settings manual that comes with the module (under the help menu of the module). You can specify that the user is "subscribed" to his/her personal folder so they will receive emails. If the employee is subscribed to the higher folder he/she will get notifications from all users (i.e. clients). Note that you can use a couple of extensions (downloadable from the Bring2mind site) to "dumb down" the UI. In this case you'd use the Letterbox extension for uploading IMO. Q: Can you prevent users from downloading documents and force them to use only the viewer to see content of the files? We don't want a breach of security by a user downloading a file, then emailing it. It would be better if they only view it. A: No. The reason is that viewing (meaning looking at the contents of a file) constitutes downloading as well. After all, any content viewed in your browser goes to your local browser cache and has effectively been downloaded. It would be trivial to "rip" content from your site and email it to someone else. Q: If I were trying to pass a link directly to a media file, so that a user could open the file in their own media player directly, could this be done? And how long would that link to the direct file be? Q: Is this version DNN 6.0 compatible? A: Yes it is. We continue to monitor in case new things crop up but until now it has been performing well on DNN 6. Q: I am interested in buying this module today. With DNN 6 being released tomorrow will this module be compatible and if not will I able to get the update at no cost? A: As far as we know it is compatible. We ran tests and keep on running tests and everything is looking good. You can rest assured that we are as interested as you in making this work 100% on DNN 6 and any other future version. 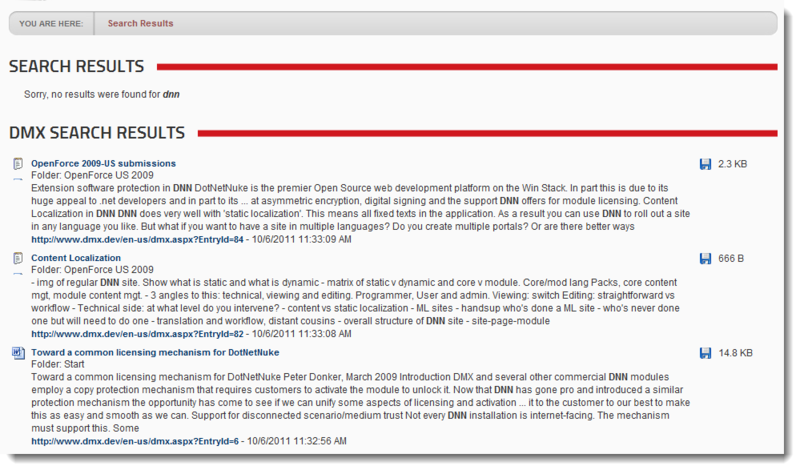 Q: We have purchased the new DotNetNuke enterpise edition version that allows us to have a content staging server. Is a separate license required for Document Exchange on the staging and the production server? A: No. The license assumes you have a staging server and you can activate on that with the same license details. For more details on licensing there is a licensing page on the Bring2mind site under the Document Exchange menu. Q: Is it possible to upgrade from 5.1 to 5.3 for less than the full price ($250)? A: DMX has a subscription model for upgrades. If you renew your license every year (current price 99 USD) you can install every upgrade during that period. Regardless of the version. Q: What is the max. supported file size, is it possible to transfer a file that is say >1GB in size? A: DMX does not limit file size. 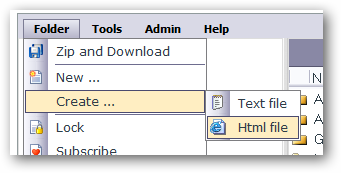 The file size is limited at the level of IIS/ASP.NET. This means you are bound to what would be the limit uploading to the file manager for instance. It requires some tuning in IIS to be able to upload to 1 Gb but this is possible. DMX includes a UI to simplify this (Web.config admin page on the Admin menu of DMX). Crucially you need to tweak not just the max upload length, but also the max upload duration (execution timeout). You'll find lots of resources on the internet on tuning IIS to accept large files. Q: We purchased DMX 5.2 in July and now want to deploy it on another website (domain). Are we required to purchase it again or do you offer licensing? what is meant by "This means that you can run up to 25 sites using DNN/DMX on a single license"? 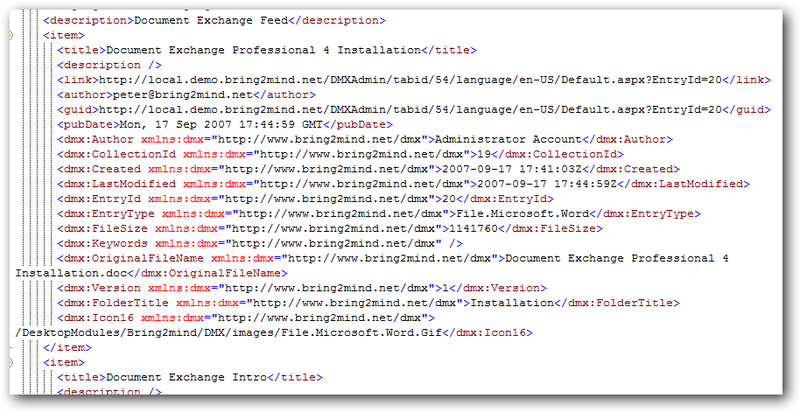 A: There is a page on the Bring2mind website (Document Exchange > Licensing) which explains the terminology. You'll need a new license if the site is another DNN installation. Q: We have a main website with different parent portals, can we share documents between different portals? A: Not directly, no. Care has been taken to prevent leakage of data between portals. But publically visible documents (i.e. VIEW rights for All Users role) can be consumed by another portal. You can leverage the RSS capabilities of DMX for this. The other portals coule display that feed in an appealing way and it would show downloadable links. But you can't show the "mother" portal's content within the regular DMX Web UI. Q: Is there any types of files which cannot be uploaded i.e is their any restriction on uploading video files (bar the max size restrictions)? A: No. 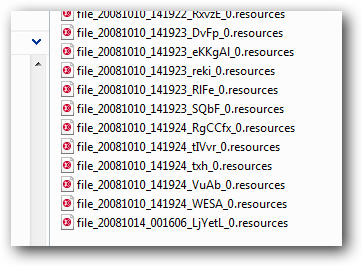 Every file is considered just a blob of bytes and file type is irrelevant. There is a finite set of inbuilt recognized file types, but you can expand on this. Q: I want a staff member to be able to upload files in bulk or in a ZIP file. Is there a simple interface for this? A: In the current version bulk upload through zip is available (you can select unzip when uploading a file). In an upcoming major release (5.3) we'll also support uploading multiple files in the upload interface. Q: I want a Staff member to be able to upload PDF payroll documents that will be viewable by employees. Is there a way that when each employee logs in they will only see their documents and not have the ability to see any others? A: Absolutely. In this case I'd advise to set permissions correctly on containing folders (one ofr each employee). Within a part of the document tree you can also decide to not let the staff adjust permissions. Added files will inherit permissions by default so that decreases chance of accidental permission tweaking by those that upload. Furthermore: you can have a page with a DMX visible to staff members only where they do the uploading. 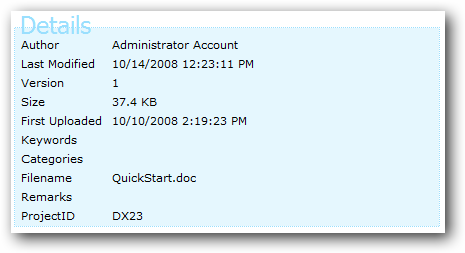 Then, on a page viewable by employees you set a DMX with a so-caleld "root pattern" which will render starting at the folder of the logged in user. That limits risk of data leak even more. Plus, it makes the user experience for all involved very smooth. Q: hello, I am interested in using your product but would like to demo it in my environment first. Would that be possible? Thanks in advance. A: Yes. Please go to the Bring2mind site and download the module through the "download" link on the home page. You will also find the installation and getting started manuals there. In the installation manual you will find how to activate the module for a trial period. Q: Please confirm that the documents module does not support comments back and forth about a file? Is there a comment field? I would think this would be pretty basic? However, have you thought of adding this feature? A: There is a comments addon to allow this. You can find it on the extensions page on teh Bring2mind site. It is free for customers. Q: We downloaded the trial version of your product, but it is telling us we need to enter a liscense. What do we need to do in order to try out your product? A: Please download the installation manual as well and follow the instructions under trial activation. Q: Is it possible to setup a directory called users and under it have a folder for each user, but when the user does click on it they only see their folder. I have several hundred users and don't want them to need to search through a list of folders to get to theirs. A: Yes. 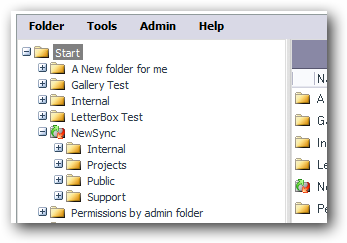 Since v 5.2.2 user based folders are supported and the user only sees the contents of his/her own folder. Those that need to see everything will look at another instance of the module which is set to show a folder higher up the folder hierarchy. Q: I need to upload about 50 PDF's a week of employee payroll files. Can I set this up somehow so that the specific files are only viewable by the individual employees? A: Absolutely. Permissions are set for files individually and can use both security roles and individual user accounts. Q: Hello - I want to use the module in a way that will support RSS feeds by document category. For example, assume I have three categories of documents (e.g., Red, Green and Blue). I want to publish three specific RSS feeds on another DNN page that will display links to the Red, Green and Blue documents - but only the ones within the category. Is this supported? Or is there a better way to accomplish this type of filtering? Thank you. Q: Greetings. 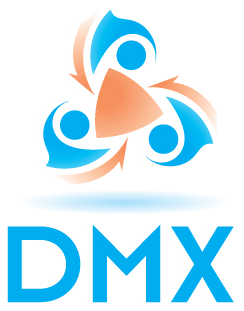 We currently have a site that is using DMX version 3.4.8 and would like to upgrade to 5.1. We currently have DotNetNuke version 4.3.5 and will also be upgrading to version 5.X. Can you tell me what are the potential issues/problems we might encounter in executing this migration. Also, what is the migration path that we'd have to take to do such an upgrade? We are trying to estimate the time needed to perform this upgrade. Any help and insight on what we are attempting to do is greatly appreciated. Q: how much is it to upgrade from DMX 3 to 5.1 pro? A: There is no longer a discount for DMX 3. There was a window back in 2007 when DMX 4 was launched but that has now transpired. DMX 4 to 5 was continuous and did not require repurchasing. Q: Is there a license option for unlimited domains across unlimited DNN installations? If so, how much? Q: I have a site with a few hundred PDF files that I want to give my site users access to that are categorized in several folders and sub-folders. I just need a module that will allow me to point to the "home directory" of the repository and it will do the rest automatically (build the tree, etc.). Is this possible with DMX? I have installed the trial but cannot figure out how to do this. Thanks! Q: I see references to Document Exchange being able to index the content of MS Office and Adobe Acrobat files. Is it possible to extend this to OpenOffice at all? A: DMX does not do the reading of the fiel formats itself, it relies on the operating system to do so. The O/S does this through a mechanism called IFilters (this is also used by Windows search for instance). The IFilter for MS Office is installed by default when you install Windows. The Acrobat IFilter can be downloaded from the Adobe website. Any other formats you'll need to find the IFilter from the vendor. Note this is very generic and I assume there is an IFilter for OpenOffice documents. 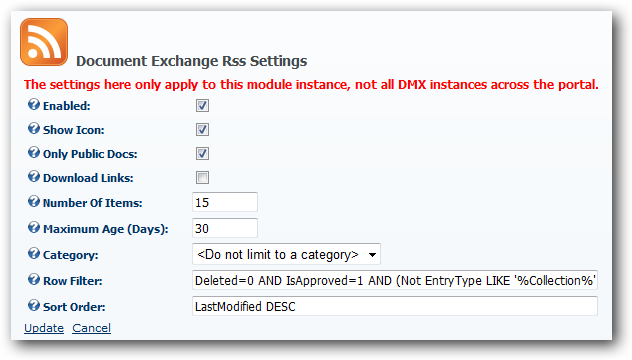 Q: Can I integrate DMX with Amazon S3? If not is it in the feature plans? A: Not in the current version (05.00) but it is planned. Q: Good Morning, Do you have a trial or online demo of this product? Q: do you have a version that includes source code? Q: This appears to be a great module, I have a client that wants to allow users to create folders, upload files and give permission to individual users on their own. Is there a way for a single user to pick another registered user to say you have permission to see my file or work? Q: On your website you have a search (DNN search box) and the search results returns "Search Results" and "DMX Search Results." Does this DMX search results feature come with Document Exchange? Q: what companies have installed this software? Q: Is it possible to control the sorting of folders (date descending, alpha, etc.)? A: Only on the columns displayed for now. Future flexibility in columns and sorting is planned. Also, it is not too hard to make a custom view of the documents in a straight datagrid. The main UI is meant first and foremost to manage content. For presentations there are always alternatives. Contact us to ask more details. Q: I have an app where we need to upload approx 100 docs each week with each document being associated with a separated user. Is there an interface that will allow me to batch the upload and specify the permissions easily? A: Yes. Several addons are in development like those distributed for DMX 3. Find them on Bring2mind.net. E.g. (Cat)Shortlist that provide a simple click-download list of documents from a single folder/category. Q: Will Doc Exchange 4 still function when DNN5 is released? Do you anticipate a new version of Doc Exchange to be released quickly after DNN4? A: I cannot give an answer to the first question. DNN 5 is nearing beta, but it is impossible to say at this stage what the definitive form will be. Regarding the second question: Yes. I am involved with the Core Team and follow developments closely. I do, however, reserve the right to 'lag behind' as it is generally not a good idea to use a .0 (let alone a .0.0) in production and breaking changes are expected (and DMX is a fairly complex module). But in the long run DMX will evolve with the platform, for sure. Q: I have an application where I'll want to organise about 10,000 documents in about 2,500 folders and subfolders. Will DMX handle that easily? A: Yes. Note that if you import them all at once then they'll be physically stored in one directory which might give some issues on the server. But this can be repaired by hand (contact me for details if necessary). Otherwise there are no issues. DMX scales very well. Q: I would like to test V4 in Localhost on my XP Pro PC. Is this possible? A: Yes. Download the trial module from bring2mind.net (link on the front page). The only thing you'll not be able to test is WebDAV because XP is IIS 5. Q: Does the search feature respect the role or user based permissions set on the document or folder? A: Yes. This is key in the solution and philosophy behind DMX. You see what you are allowed to see and access. Q: is there a demo version available if so where do i find it? Q: We are too concerned about security of our docs, but we do need to have ftp access to the files. Is this possible? A: This is a contradiction in terms. FTP is inherently unsafe and for that reason alone DMX does not support this. There is WebDAV as an alternative. Q: I have a situation where user wants to be able to open excel document , make changes to the document and save it on the server. Can this be done ? A: Yes. This is possible with WebDAV. Q: Can this module be used with SQL 2005 Express ? Q: What is the maximum size for upload/download? A: The upload component that is used under full trust handles files up to 2 Gb. Under medium trust the regular ASP.NET component is used which uses limits set in the web.config. In either case you'll need to specify the maximum size in the web.config. In the latter case also the executionTimeout. Q: I have installed the software for testing and like it so far. I would like to allow several others to beta test and get their feedback before we purchase. Is it possible to get a 30 day activation for testing? A: Yes. You can activate the module using a 'trial' license which gives one Month of fully functional operation. Q: I'm very interested in your module. One of the features I'm looking for is the ability to show a list of document titles/dates uploaded etc to unregistered users on my portal but not allow them to click and view/download the data unless they register. Since you do not offer the source code, will this information be put into a SQL Table where I can grab it and make my own module to display it? Document title, date, version, comments, type...that kind of basic information? A: All the data is there in SQL. You could even use a Reports module to run an SQL query to retrieve this data. Q: Is your module compatible with SQL Server 2005 Express? A: Yes. Just not with SQL 2000 (regular or MSDE). Q: Do you have workflow capability for this? I have users that need to submit documents for review before we can allow them to be filed. So for instance, a project manager needs to be able submit a statement of work document for review before it can be filed in their project documents folder. 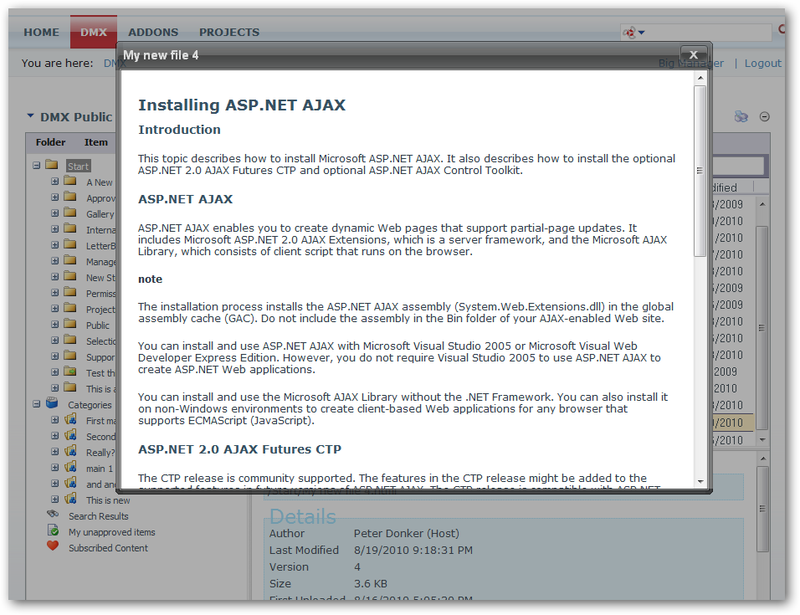 A: It does not (yet) utilize the .NET 3 WWF classes. We're holding off as we expect DNN to make a move with this soon. In the meantime the old DMX 3 way of extending the module can still be used. Many workflow applications have been made on the basis of DMX, and I'm sure your project is possible. Get in touch with us for your specific needs and we can see how it can be implemented. Q: We purchased DMX 3 not too long ago (4 months) and have been implementing it into our development site. Will the Navigator, What’s New and Shortlist modules (we have customized controls) still work the same? Is this included as an upgrade with our original purchase or do we need to purchase 4 outright to upgrade, or is there a discount? A: Some addons will be rendered obsolete (i.e. Navigator). Others will need to be adapted. In the current version the focus is on the DMX core. We expect to start updating the addons soon. For now, the addons will probably break. There is no price involved for the upgrade of free addons. They will remain free in the future. Q: Hi, I need to know if there is a way we track users downloading documents from our site. if there is no easy way, what would it take to develop it? I need to know as soon as possible. A: Any action gets logged. It is a question of getting the reports the way you want. It's all there in the SQL. You could use a regular core DNN reports module, 3rd party reporting module, or have your own baked with DMX. Q: If we are hosting on www.webhostforlife.com, will we be able to use the DMX features? A: I'm not familiar with every hosting package. It's more a question for them. You'll need (1) IIS control to use webDAV, and (2) full trust to use content search and upload control. Ask them about this. If running 'minimally' DMX 4 will still work but without WebDAV and only meta-data search and regular asp.net upload. Q: Does your module have any option to add an existing folder via UNC on a remote machine using impersonation for authentication? Basically passing a user that lives on the remote machine or domain that has full permissions and then using your module security for permissions via the DNN portal? Thanks! A: No. DMX manages its own contents and can never use a share that is used by others. It is able to store its own contents in a repository. Using WebDAV you might also use 3rd party tools to synchronize. We're looking at an inbuilt synchronization as well. 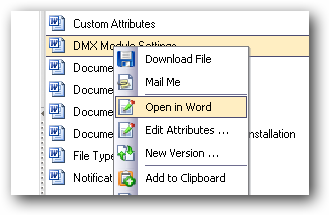 But the underlying document repository is always exclusive to DMX. 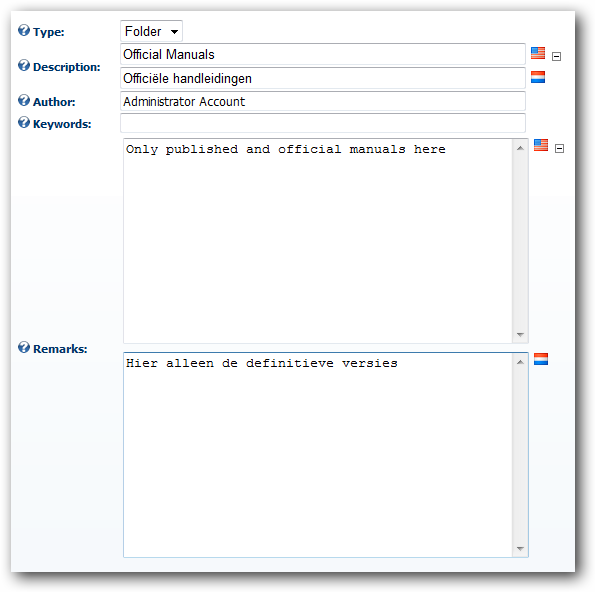 Q: Can DNN search within/the content of PDFs using your product? Meaning... just by using DNN default search function, the return will also now include the content from uploaded .PDF docs. A: Yes, it will provided you install Adobe's Acrobat iFilter on your web server. This is a free download from Adobe. Q: Will the source code be available for sale? A: No. Due to licensing restrictions of included 3rd party components it is not possible to distribute a useful source distribution. Currently we're working on a combination of an escrow arrangement and a partial source version for OEM customers. In that distribution only UI source code would be included. A: Please contact us directly through [email protected] for this. Q: Is your module compatible with MS SQL Server 2000? A: No. Only MS SQL Server 2005. Q: Hi there, I have an inquiry about your your search; 'Search of both meta-data and content' Does it search content in Word and PDF? If it searches Word does it require Server to have Windows Indexing Services running? If it searches PDF's, is PDF IFilter v6.0 required? Look forward to your reply. Q: Is there a trial version or are the manuals available for review prior to purchase? A: Yes there is. Find it on Bring2mind.net under downloads. Q: Is there a demo of DMX 4 up that we can play with? We using DMX 3 extensively and I would like to see the differences. A: I'm working on this. Give me another couple of days or so to get this set up. Q: How easy or difficult is it to upgrade from version 3.x. Are the documents automatically converted, or does this need to be done manually? of DotNetNuke Corp, Seattle, Washington, USA. (iii) copy the Software for back-up, archival purposes provided any copy must contain all of the original Software's proprietary notices. b) Peter Donker may modify this agreement upon written notice to you. (iv) remove any proprietary notices or labels on the Software or Documentation. Title, ownership, rights, and intellectual property rights in and to the Software and Documentation shall remain with Peter Donker. The Software is being delivered to you "AS IS" and Bring2mind and Peter Donker make no warranty as to its use or performance. PETER DONKER DOES NOT AND CANNOT WARRANT THE PERFORMANCE OR RESULTS YOU MAY OBTAIN BY USING THE SOFTWARE. EXCEPT FOR ANY WARRANTY, CONDITION, REPRESENTATION OR TERM TO THE EXTENT TO WHICH THE SAME CANNOT OR MAY NOT BE EXCLUDED OR LIMITED BY LAW APPLICABLE TO YOU IN YOUR JURISDICTION, PETER DONKER MAKES NO WARRANTIES CONDITIONS, REPRESENTATIONS, OR TERMS (EXPRESS OR IMPLIED WHETHER BY STATUTE, COMMON LAW, CUSTOM, USAGE OR OTHERWISE) AS TO ANY MATTER INCLUDING WITHOUT LIMITATION NON-INFRINGEMENT OF THIRD PARTY RIGHTS, MERCHANTABILITY, INTEGRATION, SATISFACTORY QUALITY, OR FITNESS FOR ANY PARTICULAR PURPOSE. IN NO EVENT WILL PETER DONKER BE LIABLE TO YOU FOR ANY DAMAGES, CLAIMS OR COSTS WHATSOEVER OR ANY CONSEQUENTIAL, INDIRECT, INCIDENTAL DAMAGES, OR ANY LOST PROFITS OR LOST SAVINGS OR FOR ANY CLAIM BY ANY THIRD PARTY. THE FOREGOING LIMITATIONS AND EXCLUSIONS APPLY TO THE EXTENT PERMITTED BY APPLICABLE LAW IN YOUR JURISDICTION. PETER DONKER'S AGGREGATE LIABILITY UNDER OR IN CONNECTION WITH THIS AGREEMENT SHALL BE LIMITED TO THE AMOUNT PAID FOR THE SOFTWARE, IF ANY. This License Agreement shall terminate automatically if you fail to comply with the limitations described in this license. No notice shall be required from Peter Donker to effectuate such termination. Upon termination, you must destroy all copies of the Software and Documentation. Under no circumstance are you allowed to use these components other than in conjunction with the Software unless otherwise stated by the copyright holder. You also agree to any license agreements enclosed with the Software from these copyright holders.